Sanibel Island is a sanctuary island and tropical paradise located just off the coast of Fort Myers, Florida in the Gulf of Mexico. Sanibel's casual and relaxed atmosphere make it the ideal family vacation spot! Coquina Beach is a 40 unit condominium complex located on Middle Gulf Drive, two miles from the historic Sanibel Lighthouse. Our Non-Smoking unit has all the comforts of home. 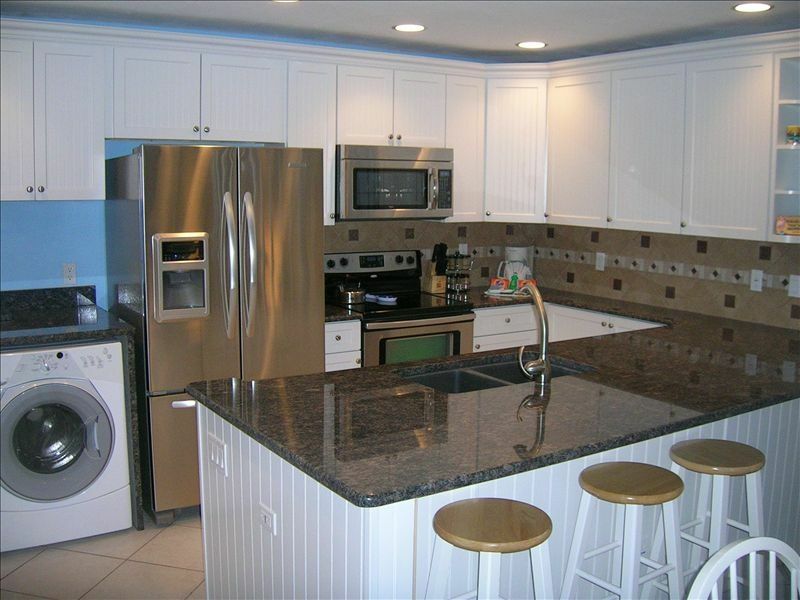 The kitchen has been recently updated with new cabinets, granite counter top and all new stainless steel appliances. Both bathrooms have been updated with new cabinets, tile flooring and granite countertops. The floor plan features a loft overlooking the living area providing a very open feeling. The master bedroom has its own access to the screened lanai. The guest bedroom has two additional twin beds. All told, the unit will comfortably sleep six guests.50" HD T.V. 's in Living Room with Xfinity cable digital package and Netflix. Master Bedroom has a 38" HD TV, 2nd bedroom has a 32" HD TV. All TV's have extra HDMI ports. There is one parking spot designated for our unit in the parking lot. This condo's greatest feature is the direct Gulf beach access, about a one minute walk. This means you can have the same beach access as the Gulf-front condominiums at literally half the price they charge. Reside in northern Ohio, like to vacation at Sanibel and other outdoor venues with LOTS of natural beauty. Sanibel has been a great place for family vacations, with many options for kids and adults--together, and by themselves to relax and have fun. We visited here in 1998 and fell in love! Couldn't imagine NOT having a relaxing and wonderful time on Sanibel--at any time of the year. The sanctuary areas on the island offer a break from development and keep Sanibel Island a natural wonder. Wildlife abounds--from dolphins and manatees along the beach to a wide variety of beautiful birds, alligators, and the shelling on our beach is world renowned. Keurig coffee maker and a traditional coffee maker. Small library includes mystery, suspense by popular authors. Great condo. Just right for our family! Thanks for sharing this condo with us. We loved the proximity to the beach, the pool, and pickleball/tennis court. It has everything you would ever need for your beach vacation. We enjoyed the screened in lanai. The loft space is a nice bonus as well. We enjoyed the TV, WiFi, and games during the evenings. Thank you! Glad to hear that you enjoyed your stay on Sanibel. We work hard to make sure everything is ready for our guests so they can focus on having a great vacation!! This chill condo is a quick walk from the beach, has many homey features such as a well-equipped kitchen, comfortable beds, beach chairs and toys, games, books, and TVs. There’s a grill just down the stairs and a lovely pool a few feet in the other direction. No gulf view, but a breezy lanai does welcome a warm morning sun. Very comfortable, relaxing place to immerse into Sanibel beach culture. The Condo was beautiful, it had everything we needed for our holiday, it was comfortable & felt like it was our ‘home’ for two weeks, the pool was great, ideal for cooling off and relaxing, the beach was only a few steps away. We had a great time and well worth the very long journey it took for us to get there. We loved it thank you so much. I am happy to hear that you enjoyed your two week stay at our condo. Sanibel Island is a great place to vacation. We work hard to keep our condo up to date and comfortable for our guests. This 2nd floor condo has many upgrades and is located a very short walk to the beach access. The kitchen and baths have been updated with new cabinets and counter tops, as well as new appliances. Smart TV is a nice addition for relaxing in the evenings. One drawback is only ONE parking space available per unit, with only one guest space for entire complex. Lots of beach chairs and toys available to use as well. Master bed could use updating, as well as at least one set of twins (for larger teens or adults who can't sleep in a twin bed) . Otherwise, another great week at Sanibel for our family of four. The property was great. I would recommend that the cleaning crew do a little better job when prepping for incoming vacationers. Needed to sweep after we arrived but all in all this place is great. Really loved all the updates to the kitchen and use of space throughout. Also had all the amenities for the beach which was nice. I love this complex since its smaller and more quaint than others we have stayed at. We have stayed in Coquina Beach 4 times and would definitely look at this unit again. One of the world's best beaches for shelling; free exotic bird show weekdays on island--outstanding! ; bike paths throughout the island provide safe place for families to walk & bike; rentals available for bikes, baby equipment, water sports equipment (boats, jet skis, paddleboards, kiteboards, etc); Shell museum, Wildlife refuge, Nature center, Wildlife rehab facility.